There have been many moments throughout history which have brought many changes, advancements, and improvements. The Body of Christ is no different. Ever so often, the church goes through a period of transition which adds to the church. Such was the case in 1988 when the Tennessee Fifth Jurisdiction had its genesis. It was in this period of history that the General Board of the Church of God in Christ, Inc. declared that Tennessee was an open state and gave pastors the option to choose which jurisdiction they felt they were best suited for. 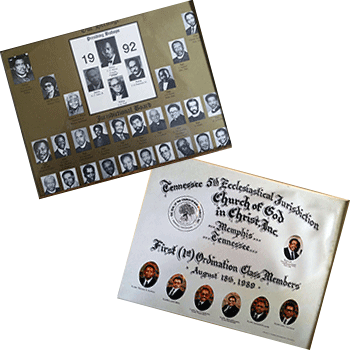 Overwhelmingly, more than sixty (60) men chose to follow Bishop Samuel Leon Lowe in the newly organized Tennessee Fifth Ecclesiastical Jurisdiction. Bishop Lowe immediately began to organize the jurisdiction in October 1988. 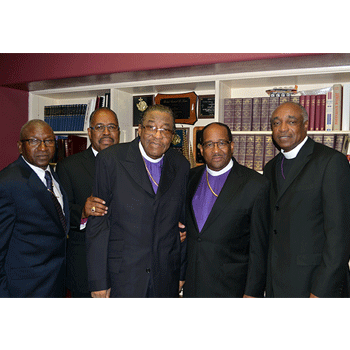 Through much prayer and fasting, Bishop Lowe appointed the first Executive Board of the jurisdiction. The original board members were: Administrative Assistant J.D. Porter, Administrative Assistant Charles Rogers, Superintendent Jesse Lipford, Superintendent Tom Tucker, Dr. T.R. Burnett, Superintendent J.E. Chandler, Superintendent Samuel Carpenter, Superintendent C.C. Carlock, Superintendent Stephen Biddle, Superintendent Dudley LeWellen, Superintendent Elmo Randolph, and Elder Clarence Randle. 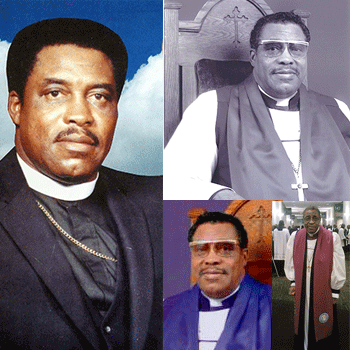 These men served both in the jurisdiction and the bishop faithfully and to the best of their God-given ability. Bishop Lowe selected Mother Rosa Wilson to serve as the Supervisor of the Women Department. Mother Wilson was assisted by: Mother Mary Holman, Mother Rebecca Barnett, and Mother Barbara Wells. 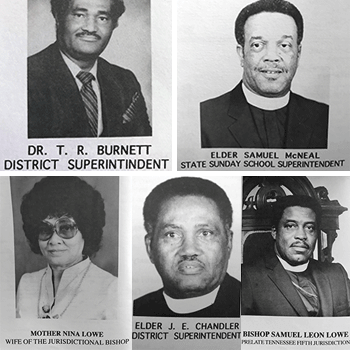 Other persons appointed to serve were: Jurisdictional Sunday School Superintendent – Elder Samuel McNeal and State Field Representative Georgia Macklin; Jurisdictional YPWW President – Elder Dickerson Wells and State Chairlady Dixie Stokes; Missions President – Elder Freddie Wesson; Evangelism President – Elder Albert Clark. The Women Department grew and assisted the jurisdiction in attaining the goals and the vision that God had given to Bishop Lowe. During the first five years, the Tennessee Fifth Jurisdiction experienced phenomenal growth. People were excited about the jurisdiction and the new leader and the people were doing great and wonderful things. It was during this time that the jurisdiction adopted the motto: “An ordinary people, doing extraordinary things in an ordinary way”. Because of the phenomenal growth of the jurisdiction, the Lord impressed upon Bishop Lowe’s heart to find another building to house the ministries and expansion of the jurisdiction. Being the infant jurisdiction that it was, there were many challenges and obstacles. The Lord gave Bishop Lowe the vision to purchase the property at (The former Baron Hirsh Synagogue) on Vollintine. This proved to be an awesome and tremendous task. The building appraised at an approximate value of more than $2,000,000.00. This was a very momentous task and milestone for this infant jurisdiction. But the Lord was with the Tennessee Fifth Jurisdiction. There was much work to be done on the building and the Lord placed it on the hearts of various men to aide and assist Bishop Lowe in completing the task. The following men worked untiringly to ensure that the work would indeed be completed. They were: Elder John Wesley Arijie, Superintendent Stephen Biddle and Minister Dylan Biddle, Elder Clarence Randle and Brother Clarence Randle, Jr., Elder Samuel Garner, Superintendent Tommie Williams, Superintendent Samuel Maxwell and Dr. T.R. Burnett. These men were instrumental in helping to bring the Bishop’s vision to fruition. The Lord enabled Bishop Lowe and the jurisdiction to purchase the building and burn the mortgage on the building in five (5) years. Glory to God! In August 2014, Bishop Lowe requested to be honored as Emeritus Bishop. The Presiding Bishop (Blake) and the General Board honored his request. The Pastors of Tennessee Fifth Jurisdiction overwhelmingly chose Bishop Jerry W. Taylor to lead the Tennessee Fifth Jurisdiction. The history continues to be written. 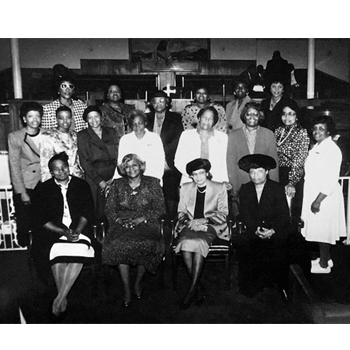 The Tennessee Fifth Jurisdiction faced its challenges and obstacles. However, through faith and trust in God, we have maintained the integrity and wherewithal to be a safe harbor and guiding light for those men and women who are in need of guidance and assistance. We are Tennessee Fifth Ecclesiastical Jurisdiction.